Seven Stars Farm Store. You can also purchase on our farm, just call or email to make an appointment. Our Summer Meat Share runs from June-September. It includes a monthly assortment of our pastured pork, chicken, and Seven Stars Farm beef. It's a convenient way to get a variety of cuts throughout the season. ﻿Bulk bundles are perfect for customers that like to buy in bulk, but don't have room for a whole or half hog. These bundles include a variety of premium cuts. For those looking to buy in larger quantities, whole and half hog shares are often available throughout the year. For more details, click on our whole/half hog pricing page. Our hogs and chickens are fed a grain mix that is grown & freshly ground on our farm. The grains are GMO-free and grown in accordance with the organic standards. Our farm is currently not certified organic, but we are actively seeking certification. Stay tuned! Our pigs also receive organic yogurt and milk, and various forages depending on the season. They DO NOT receive prophylactic or routine medications. They DO receive as much green plants, sunshine, & clean water as they desire! 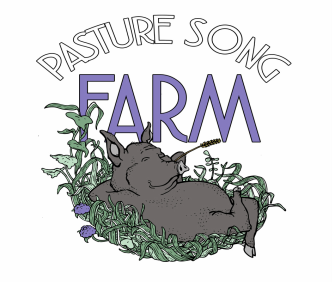 ﻿Contact us at pasturesongfarm@gmail.com or by phone, (717)475-0129, for more information and to reserve your order.